If you think that your age prevents you from looking good, think again. In fact, the way we dress is what mostly affects our outward appearance. Clothes that don’t properly fit or are matched with the wrong pieces will look bad on anyone whether you’re a 20-something girl or woman in her 60s. With that being said, every piece of clothing in your wardrobe should be carefully chosen. So, let’s start with pants – the outfit staple for many mature women. If you love the comfort and freedom that comes with wearing pants, here are some great tips on how to look fabulous in them. When looking for pants for older women that look amazing on you, it’s important to consider your body shape. For instance, if you have fuller hips and tights, you may want to stick to straight or wide legs that downplay curves. But if you want to still rock narrow pants, choose a pair that has a little more width at the top while being growing narrower towards the ankle, like for instance tapered pants. Also, the darker the colour of the pants, the less emphasis on your lower body. On the other hand, if you have slimmer legs and narrow hips, you can get away wearing both narrower and looser pants. When it comes to the height of the waistband, high-rise and mid-rise pants look most flattering on all body shapes. However, if your tummy makes it a little uncomfortable to wear high-rise or mid-rise pants, opt for fabrics that include at least 5% spandex which can offer you some stretch and help you avoid the dreaded muffin-top. When it comes to creating tasteful outfits featuring pants for older women, choosing the right top is super important. A simple rule is to never mix tight pants with a tight top, as well as loose pants with a loose top. Always try to combine one tight and one loose piece. This way, you can create a more balanced and flattering look for the mature body. For instance, while tight pants might elongate and slim the legs, they do accentuate the hips which is something that many older women dislike. So, when pairing them with a loose hip-length shirt or cardigan or a tunic, you can soften the hip area. Also, avoid being dressed in loose clothes from top to bottom as this look can age you. You’re never too old to wear jeans. A pair of jeans can look great on older women as long as they are the right fit and colour. 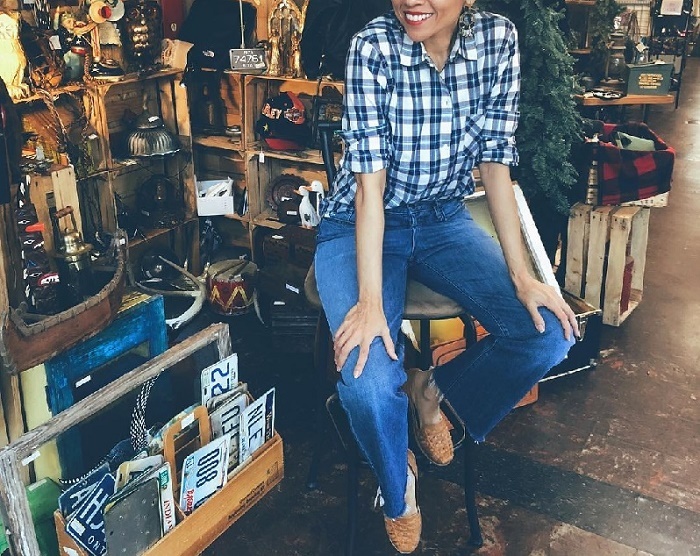 Straight-legged jeans in a darker colour tend to flatter most mature women and can look classy and sophisticated for a business-casual outfit. As a general rule when you wear jeans for a dressy look, always opt for dark blue or even black. On the other hand, for more casual occasions you can opt for boyfriend jeans or even skinny jeans with a medium to high waist. The right pair of jeans can look great on you whether you dress them down with a pair of Converse trainers or cowboy boots or dress them up with stilettos or ballerina flats.